Is the gloomy Fall weather getting you down? Are you in a creative rut or haven't been feeling that inspired lately? Haven't touched your Instagram account in a while because of that? Well, guess what Friends? The #CraftyBlissChallenge is back for another round!! Julie (of Knitted Bliss) and I had so much fun with the Spring version that we hosted back in April that we knew we wanted to do another! So we are. Get your cameras ready for another 10-day Instagram challenge starting this Friday, October 28th!! If you've joined our challenges in the past then you already know what to do. If you're new to my blog you can read about the challenge we had last spring here, and if you've never done an Instagram challenge before here's a quick brief: it's a photo challenge that spans over a set number of days and each day you are given a prompt that you can interpret in any way you want, then take a photo and share it on your Instagram account. We made the #CraftyBlissChallenge short and easy in that it's only 10 days long. Totally do-able, right? Our prompts are broad and not knitting specific, which means there's no right or wrong and anyone can join in on the fun! Yes, some people keep their photos knit-focused but most are pretty amazed at what else catches their eye and inspires them. Speaking for myself, I know I need to be reminded from time to time to look outside the box, to take a good look around and see things in a different light. Sometimes we get so caught up in the usual day to day things that we forget to stop, breathe, and enjoy the moment. I know a lot of people feel the same way and so I'm excited to see what people come up with for each prompt! Like our previous challenges, the Fall edition will also be 10 days long and will commence Friday, October 28th and will wrap up on Sunday, November 6th. Julie and I would love it if you could join us! To participate: You will need an Instagram account, which is free to sign up! Then for 10 days get inspired, be creative, take photos daily, add captions (or not, totally up to you!! ), tag each photo with our special hashtag - #CraftyBlissChallenge, and share!! Pro Tip: Save the image above or bookmark this post in your web browser and come back every day of the challenge, to help you remember the prompts. Please note: If your account is set to private, neither Julie or I will be able to see your images!! If you want to participate, if possible, please set your account to "public" so that we can see and enjoy your photos. When the challenge is over you can switch your account back to private. Julie and I will be popping in a few times daily to not only share our own photos, but to also check out what people are posting via the hashtag feed. 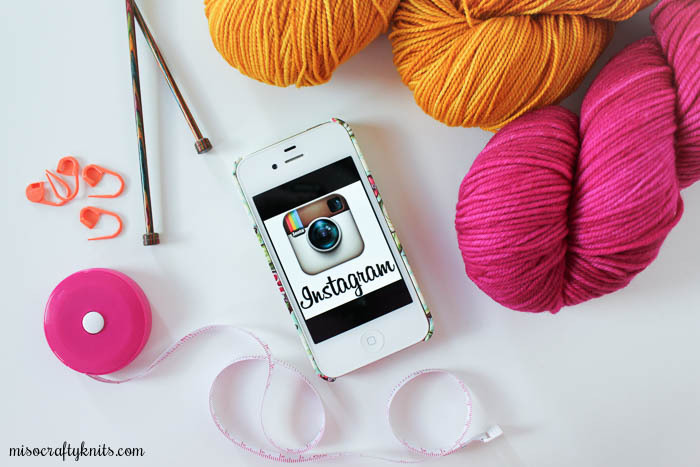 Follow both of us on Instagram: Julie is @knittedblissjc and I'm @misocraftyknits to see our takes on the daily prompts (or to check out our feeds in general). Even if you don't want to join or simple cannot participate in this round, I hope you will still follow along on the challenge and see what everyone is posting. I love the great little community that forms during the challenge and it's so fun to get inspired, meet new people, find new accounts/dyers/designer to follow, and yes...possibly add to your stash and queue! Prizes!! : To add to the fun, two randomly selected participants who have completed all 10 days of the challenge will be chosen to win some knitterly goodies! It could be yarn, it could be notions, it could be tea. Heck, it could be all three! Who knows! So remember to tag each photo with the hashtag #CraftyBlissChallenge so that Julie and I can see your photos and follow along on your challenge progress! WooHoo!! This is going to be awesome!!!! I am so glad this on again! Always look forward to participating in this! !